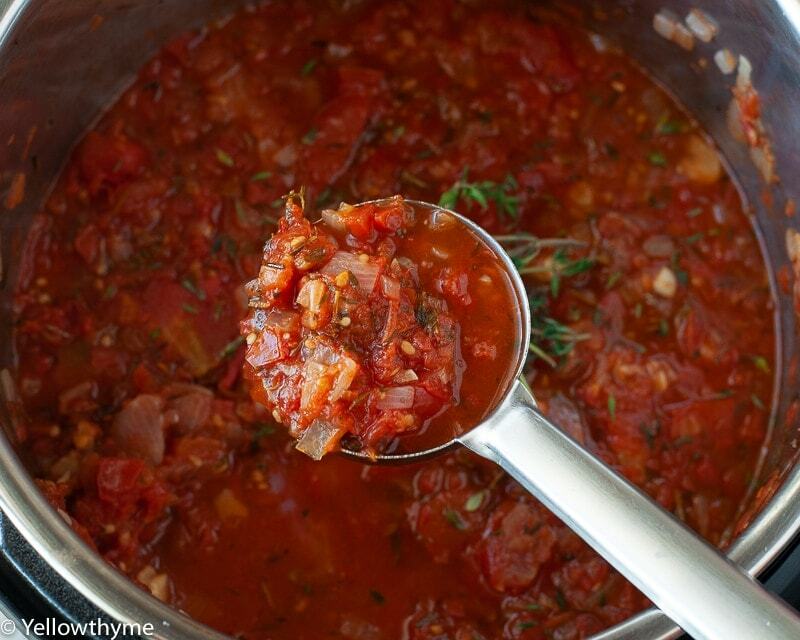 Marinara Sauce with Fresh Tomatoes with both Instant Pot & Stove Top Recipe methods.This is a sauce that will come handy when making pasta or Pizzas or even Shakshuka – baking eggs in tomato sauce.I love it for it’s robust flavours and versatility especially for the amount of effort which it takes. The thing is, I am always on the lookout for a good pasta sauces.My all time favourites are the Roasted Tomato Red Pepper Sauce-Versatile Tomato Pasta Sauce and the Quick Cherry Tomato Sauce but lately I don’t have the time or patience to make either of those and I need a lot of pasta sauce.My son suddenly loves pasta.I know it’s a phase like everything else but I have to capitalise on it as much as possible cause that’s the only carbs he eats well. So that’s the reason this recipe evolved.I NEEDED a sauce that was quick, healthy and could be made in large quantity without too much work.This sauce is all of that and more! All you have to do is, pop it in a freezer bag and dump it in the freezer.It should ideally last 3 months in deep freezer and a month in normal everyday freezer. If making this in bulk, I suggest you freeze it in your required serving size packs so you only have to take out that one pack for one meal. Are you looking for more quick pasta recipes?Then you have to try my Penne Pasta in Creamy Alfredo Sauce and Pasta in Butter Garlic Sauce.These are my goto pastas when I dont have any other veggie on hand.Also, a must must try is my Skinny Mac and Cheese with pumpkin sauce.It’s Legendary! Choose the "SAUTE" setting and heat the instant pot.Once hot, add oil. Add the Garlic & Onions. Sauté occasionally.Cook till translucent. Meanwhile,Pulse the tomatoes(in batches if needed) in the food processor coarsely.We don't want a paste but a rough bruising of the tomatoes. Add the tomatoes to the onions.Add the Salt,Herbs-dried or fresh,Chilli Flakes. Cancel the "SAUTE"function and select "PRESSURE COOK".Pressure Cook for 10 minutes with he pressure valve at "SEALED" position. Release the pressure.Cancel "PRESSURE COOK".Select "SAUTE" and reduce the sauce if needed. Heat a large pot on the stove.Once hot, add oil. Cook covered for 15 minutes on Medium flame.Uncover, check for consistency and cook open for another 10 minutes till it's the consistency you want.